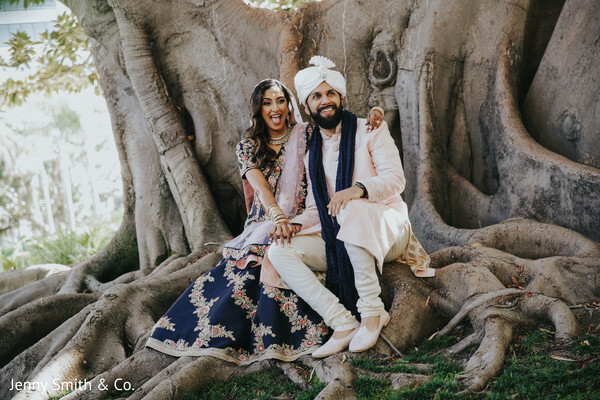 Santa Monica, CA Indian Wedding by Jenny Smith & Co.
Hey there, readers! 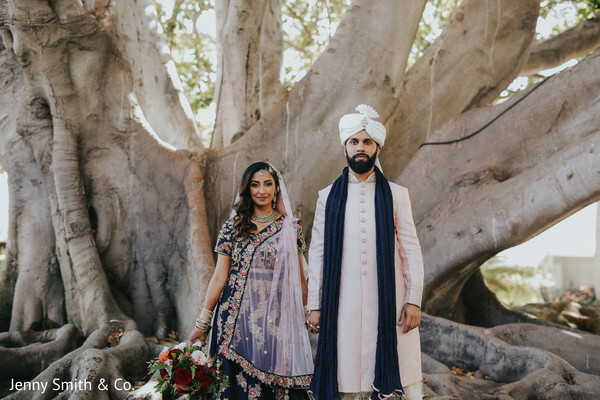 Jenny Smith & Co. captured some truly special wedding moments between today’s lovebirds Leena and Amaeya! 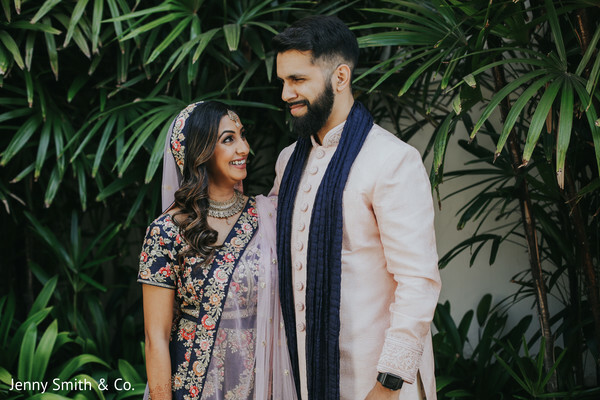 Their first look photo shoot unveils the incredibly sweet photos that fill their wedding album and highlight their beautiful wedding ceremony styles! 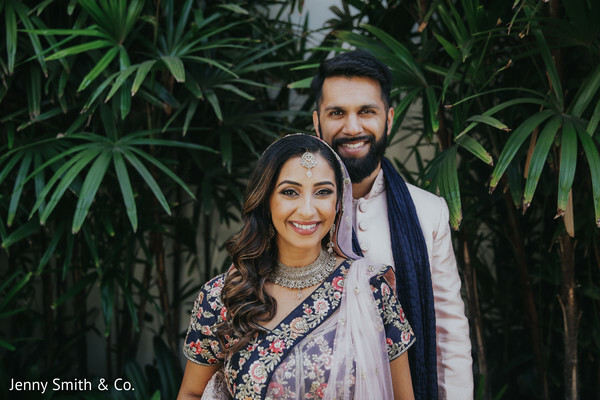 Our blushing bride, Leena, had the super talented Dolled up by Lulu beautify her impeccable hairstyle and makeup. 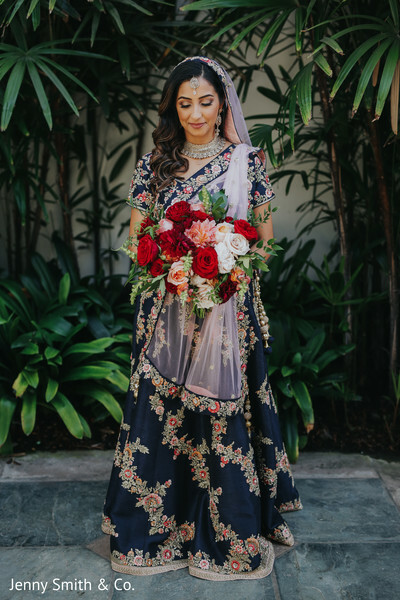 She dressed an utterly pretty navy blue lehenga fabulously embroidered with charming bold color flowers and finally carried the prettiest fresh blooms florals to finish off her look. 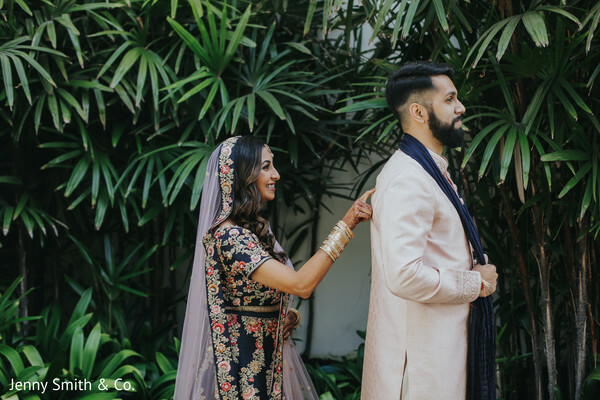 The Raja of her dreams was all suit up in a cream color and cleverly accessorized his elegant outfit with a blue scarf to match the bride’s look. 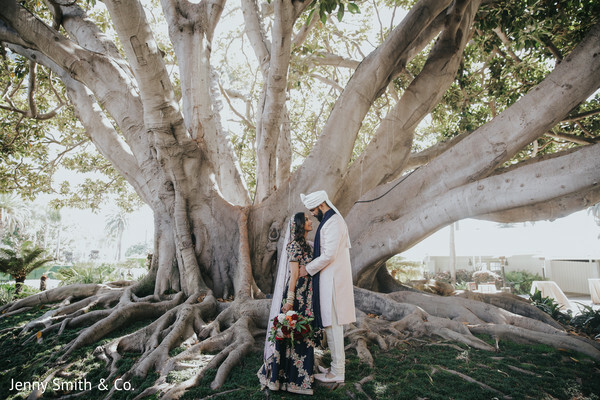 The unparalleled outdoors of the grand Fairmont Miramar Hotel and Bungalows and its iconic Moreton fig tree, was the picturesque background for these two to have their special time right just before their stellar moment. 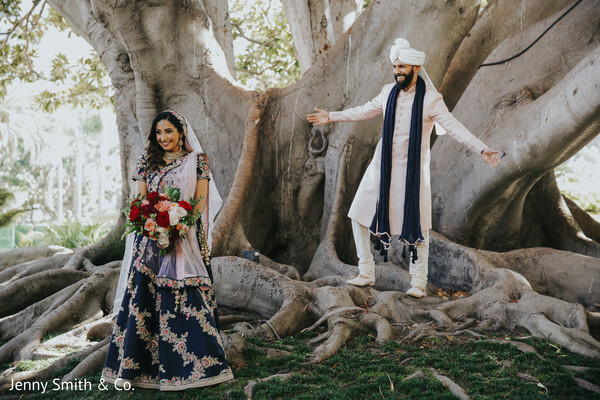 For more exclusive highlights from the bride and groom, go to our full gallery! 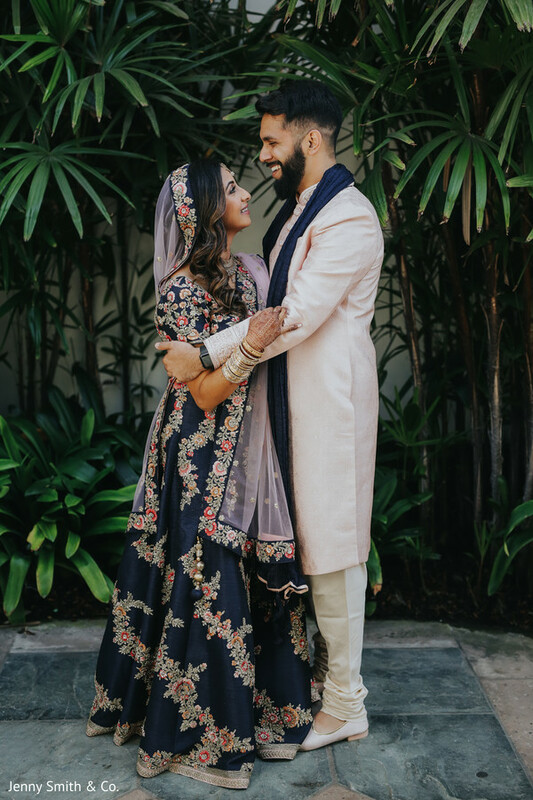 We’ll see you in a bit with all the ceremony romantic vibes. 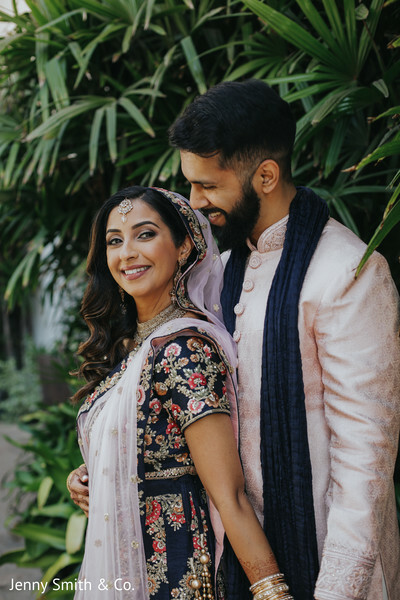 Hair & Makeup: Dolled up by Lulu | Venues: Fairmont Miramar Hotel and Bungalows | Catering: Fairmont Miramar Hotel and Bungalows | Haldi Venue: Marina del Rey | Planning & Design: Orange Blossom Special Events | Floral & Decor: Peony and Plum | DJ: Desi Junction DJs | Rentals: A Rental Connection | Linens: GBS Linen | Officiant: Maclhusoodan Bhat | Photography: Jenny Smith & Co.
Dolled up by Lulu and Fairmont Miramar Hotel and Bungalows are members of the Platinum Guide. Love what you see? Explore their portfolios.